It’s rhubarb season! Rhubarb may seem strange to some, but it has a long history for medicinal use that dates back to 2700 BC China. Ben Franklin is often credited with bringing rhubarb plant seeds to the East Coast in the late 1700s but it was only developed for culinary use in the 1800s when it became popular in Great Britain as an ingredient in dessert and the production of wine. When cooked with sugar, rhubarb has a unique tart flavor and juicy texture that makes pie lovers swoon. This rhubarb recipe is one of those desserts that you can pull together in just a few minutes. It’s all about the enjoyment of the simplicity of fruit. Although it’s not fancy, it looks and tastes like something beautiful and fresh. The rhubarb compote is made by simmering fresh rhubarb with a little bit of white wine, sugar, some orange zest and half a vanilla bean. The wine complements the acidity of the fruit and the vanilla and orange zest round out the flavors beautifully. The resulting syrup is a bright pink and it tastes wonderful. 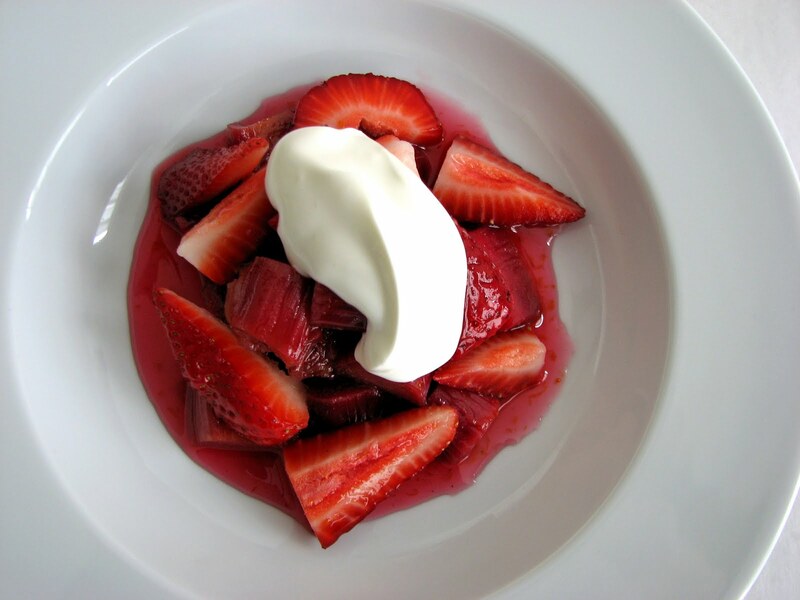 Add some fresh sliced strawberries and a dollop of crème fraiche and you’re all set. Easy, quick and a satisfying welcome to spring. - After the rhubarb compote has been cooking for a few minutes, taste the liquid to be sure the sugar level is right for you. 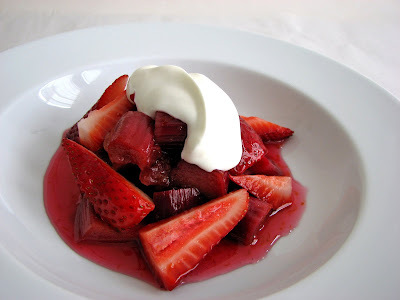 - I like a garnish of simple crème fraiche, but whipped cream or vanilla ice cream are also good options. - Also try substituting raspberries for the strawberries or adding some finely diced crystallized ginger. Wash and cut rhubarb into 1/2” pieces. Combine the wine, sugar and orange zest in a saucepan. Split the vanilla bean and scrape the seeds into the pan and toss in the bean. Bring to a simmer to dissolve the sugar. Add the sliced rhubarb and cook on a low simmer until tender. Remove the vanilla bean casing and cool the compote. Slice the strawberries into quarters. Distribute the compote in 4 bowls and add the strawberries. Pour syrup over the fruit. Garnish with cream. One of the things you learn in pastry school is how to make all kinds of French pastries using laminated doughs like puff pastry. This type of pastry is known as Viennoiserie and there is a whole line of things that are fairly simple but really delicious. One such pastry is the Jalousie, the French term for slatted or louvered windows. The name applies because several slats are cut into the surface of the top to create steam vents. Although the Jalousie is traditionally made with puff pastry, I make it with a Sour Cream Pastry dough that is fast and not as fussy to produce. 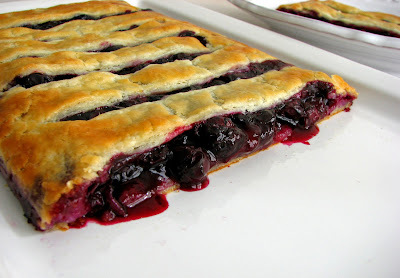 It doesn’t replicate the texture of all that great puff pastry flakiness, but is more like a simple turnover. Puff pastry certainly has its virtues, but it’s quite rich and is a fairly big project that takes quite a bit of time to prepare. I absolutely love blueberries. I love the taste and bright beautiful color that splashes like a spectacular ink on the plate. 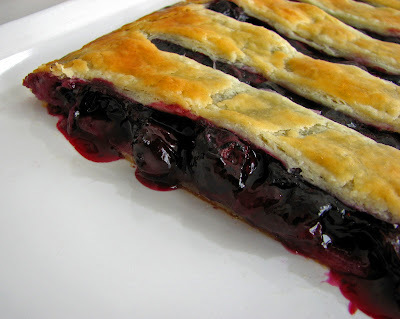 So I stuff this Jalousie with lots of blueberries. The filling is prepared by simmering some of the berries with sugar and a cornstarch slurry for just a few minutes to create some gorgeous juices. Fresh berries and lemon juice are then added to the juicy mixture to keep it tasting like pure fresh blueberry goodness. 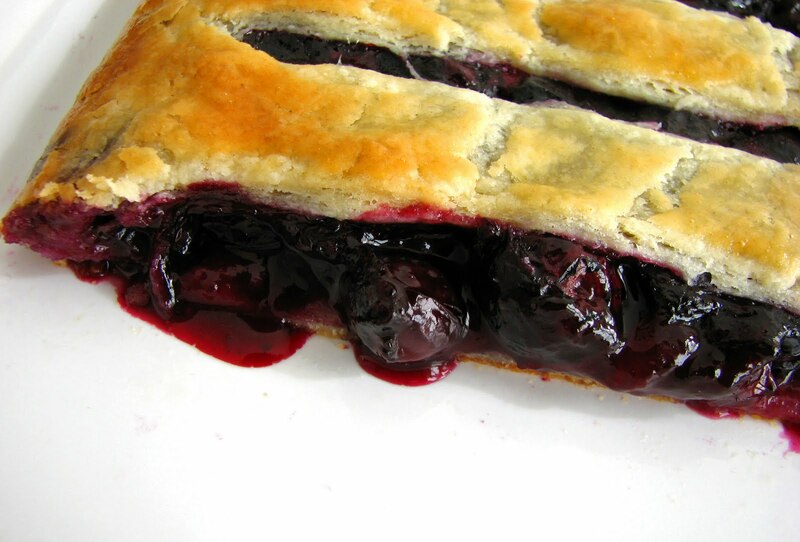 If you're a blueberry fiend like me, this pastry is very simple to make and even simpler to enjoy. 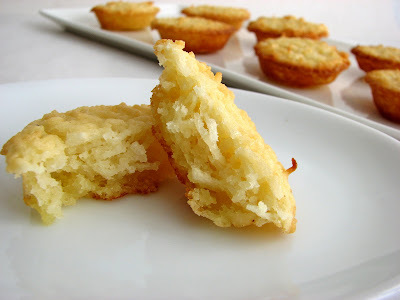 - The dough and/or the filling can be made and held separately and refrigerated overnight. - I roll the dough out on parchment paper so it can be lifted onto a baking sheet and placed in the refrigerator without stretching or tearing it. Once the dough is sufficiently chilled, it is much easier to handle and can be cut and lifted off the sheet very easily. - Fill with any fresh fruit you wish. Just be sure to adjust the sugar level and whether or not you need cornstarch based on your fruit of choice. 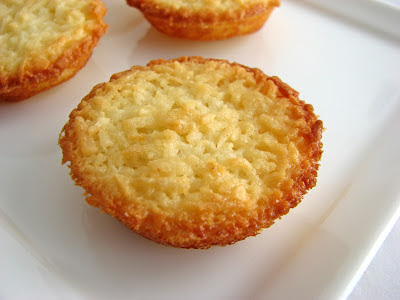 - This pastry should be eaten the same day it is baked. For the pastry, combine the flour, sugar and salt in the bowl of a food processor. Add the butter and process until the butter is reduced to smallish pieces and the mixture resembles coarse meal for the most part. Add sour cream and yolk and pulse just until the dough starts to come together. Be careful not to overmix. Gather the dough on a piece of plastic wrap and seal it. Chill thoroughly. Place 1 1/2 C of blueberries in a saucepan. Add 1 T water and 1/4 C sugar and cook over low heat until the juices start to bubble, about 2 –3 minutes. Combine the cornstarch with 1 T water and add to the bubbling fruit. Cook for just a couple of minutes until thickened. Take off heat and add lemon juice. Cool completely. Fold in the remaining 1 1/2 C fresh blueberries. Remove the dough and place on a lightly floured piece of parchment. Roll out a square measuring a bit bigger than 11” x 11”, then trim the edges to make a clean square. Cut the dough in half to make two equal pieces measuring 11” x 5 1/2 “. Stack on a baking sheet with parchment in between and chill for another few minutes to make the pieces easier to handle. Combine the egg and water to make an egg wash.
Place one of the rectangles on a parchment lined baking sheet and brush about a 1” border of egg wash. Mound the filling evenly down the middle and flatten just to the edge of the egg wash, within 1” of the edge of the pastry on all sides. Take the second rectangle and cut about 8 or so slats across to form steam vents. 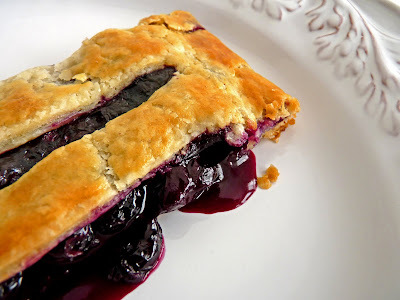 Place it on top of the blueberry mixture and press down tightly around the edge of the fruit to seal the border. Trim the dough if necessary to keep the edges neat. Refrigerate until the oven is ready. Place an oven rack in the top third of the oven and a rack in the lower third of the oven. Preheat the oven to 375 degrees. Brush the pastry with egg wash, being careful to avoid the vents. Bake on the top rack for 10 minutes, then rotate the baking sheet from front to back and move to the bottom rack. 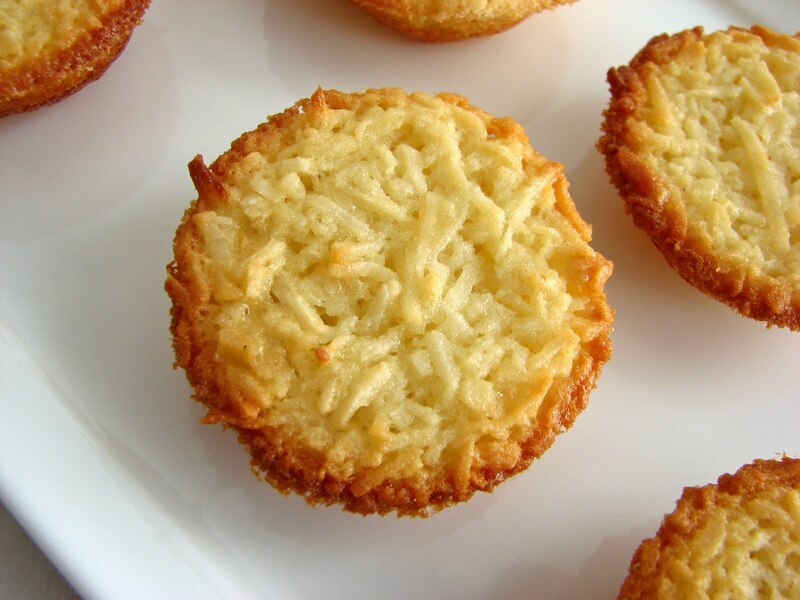 Continue baking for another 10 – 15 minutes until golden brown. Cool before handling. I seem to find myself heading back to the ice cream playground more often than not these days. I’ve been having a terrific time putting together ideas for making ice cream that is bursting with flavor and freshness. If you don’t own an ice cream machine, you are really cheating yourself out of a ton of pleasure, not to mention the profound devotion of your friends and family. I’ve had a pretty cheap Cuisinart for years and it does a very good job of producing great ice cream. For me, combining bittersweet chocolate and hazelnuts is a no brainer. 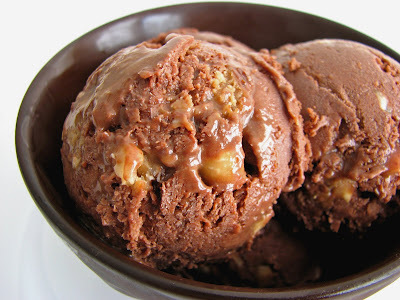 I start with a gorgeously rich chocolate ice cream base and add toasted hazelnuts that have been bathed in a brown sugar caramel pumped with a luscious jolt of espresso. The combination is incredibly delicious and satisfying. Somehow these flavors are impossibly perfect for one another. This is seriously adult ice cream. 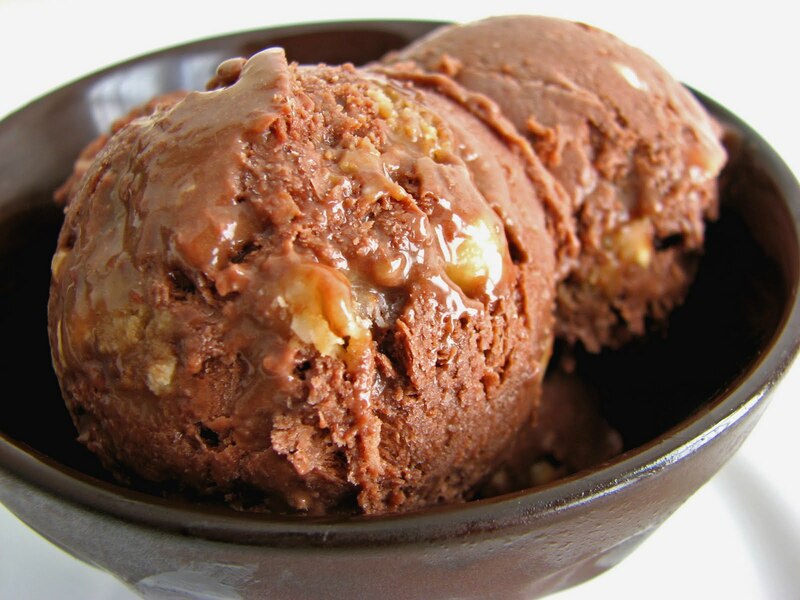 Rich, creamy, nutty and sophisticated….all your ice cream neurons will be firing in glorious harmony. Time for some dreamy ice cream. - When melting chocolate in a double boiler or bain marie, be sure to keep the water well below the bottom of the bowl and at a low simmer. Stir the mixture frequently, taking care to scrape the sides of the bowl where it makes the hottest contact with the pan of simmering water to avoid scorching. 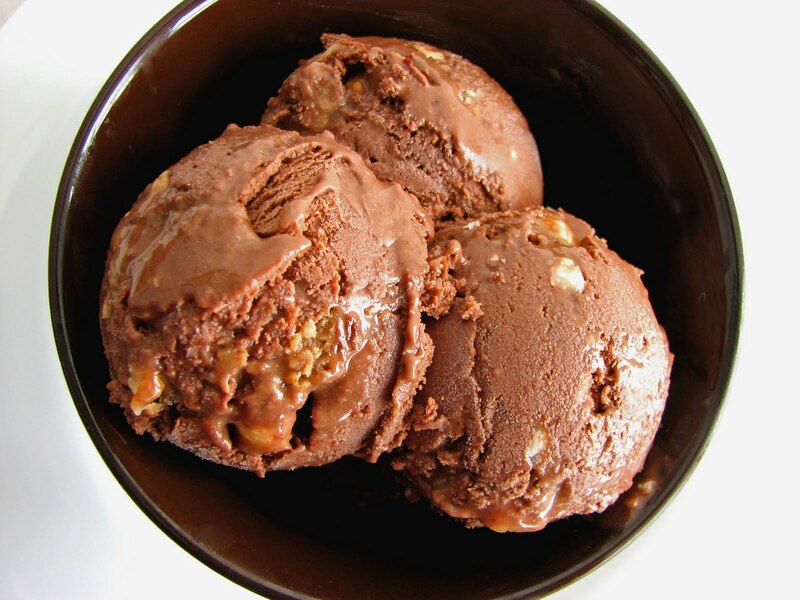 - The rum in the Chocolate Ice Cream rounds out all the flavors beautifully without the final product tasting of alcohol. - You can find espresso powder at Italian delicatessens, gourmet food shops and some grocery stores. Medaglia D’Oro is the best. I’ve also used Ferrara. 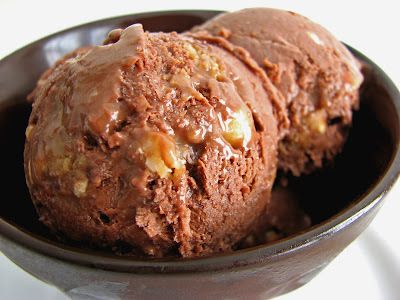 - For an extra bolt, this ice cream would make a great affogato (Italian for “drowned”), which is a scoop of ice cream with a shot of hot espresso or strong coffee poured over it. 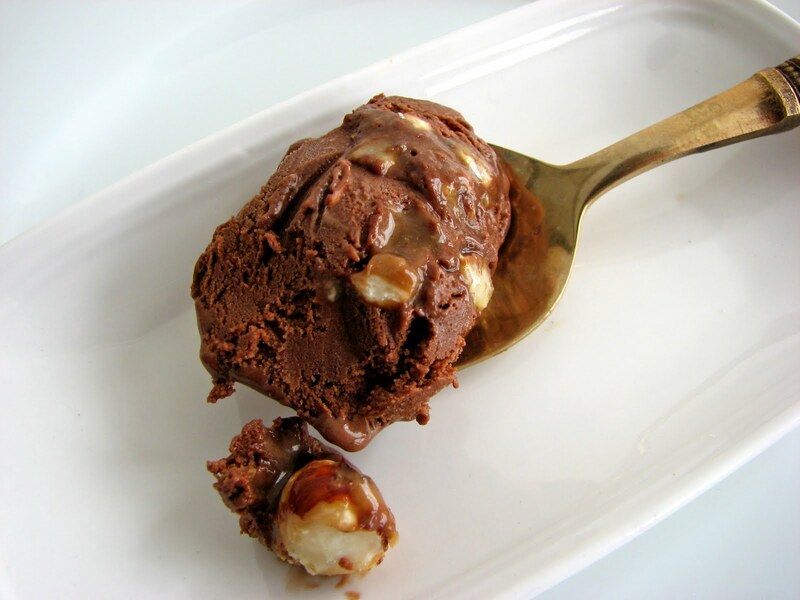 For the ice cream, chop the chocolate into small pieces. Combine with the heavy cream and warm over a bain marie of simmering water until chocolate is melted Remove from heat and stir until smooth and thoroughly combined. Set aside. Simmer the 2 cups of milk. Whisk egg yolks with the sugar until thickened and light yellow. Add some of the warm milk to temper the mixture, whisking constantly. Pour in the remaining warm milk, whisk together thoroughly and return to medium low heat. Cook, stirring constantly with a spoon, until the custard coats the back of the spoon and a finger traced through it leaves a clean track. Strain immediately into the chocolate mixture and stir to combine. Blend in the rum. Add salt to taste. Cool and refrigerate until thoroughly chilled. Place the cream, espresso powder and cinnamon in a saucepan over very low heat. Stir to dissolve. Add the brown sugar and whisk until thoroughly combined. Bring to a slow boil for a minute or so until the sugar is dissolved. Take off the heat and add vanilla and salt, to taste. Stir in the chopped hazelnuts. Freeze the ice cream according to your machine’s directions. Pour half the ice cream into a clean airtight container and layer and swirl in the hazelnut coffee caramel mixture. Repeat with a second layer of each, pressing the nut mixture into the ice cream. Press a piece of plastic wrap into the surface of the ice cream, cover and place in your freezer to firm up a bit. Although I wait in great anticipation for the new arrival of fresh spring fruit every year, I’m nevertheless always mildly surprised when it actually shows up. It’s a little bit like seeing a good friend for the first time after miles and months apart. Today, all of a sudden there are these beautiful precious things, a bright shock of color after the dreary days of winter. Strawberries are making their first appearance here in California and they are looking great. Their bright color and wonderful aroma send such a strong signal of the coming spring season, it’s impossible not to jump and make a first purchase. 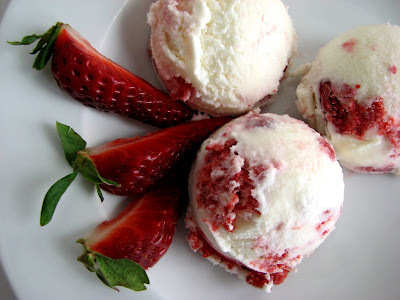 This ice cream is a great way to enjoy some terrific juicy strawberries. 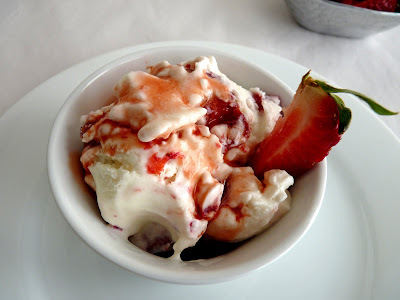 They are sweetened and enhanced with a bit of balsamic vinegar and then folded into a tart ice cream base to produce a grand pleasure reminiscent of a simple bowl of strawberries and cream. I think you’ll find this a very enjoyable way to welcome a new crop of gorgeous and glorious fruit. Spring has definitely sprung! - Taste your strawberries to gauge their sugar level and then keep tasting as you add sugar. - Substitute brown sugar in the strawberries if you prefer. 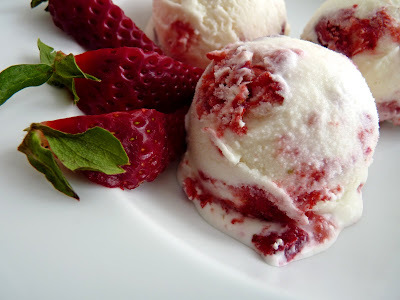 - Since strawberries contain quite a lot of water, if you won't be consuming all the ice cream at once, the strawberries will need quite a lot of sugar and should be pureed to avoid becoming too icy in the freezer. - If you enjoy balsamic vinegar, you'll love the reserved syrup generously spooned over a bowl of the ice cream. After you've strained out the strawberries, taste for any additional sugar or balsamic. 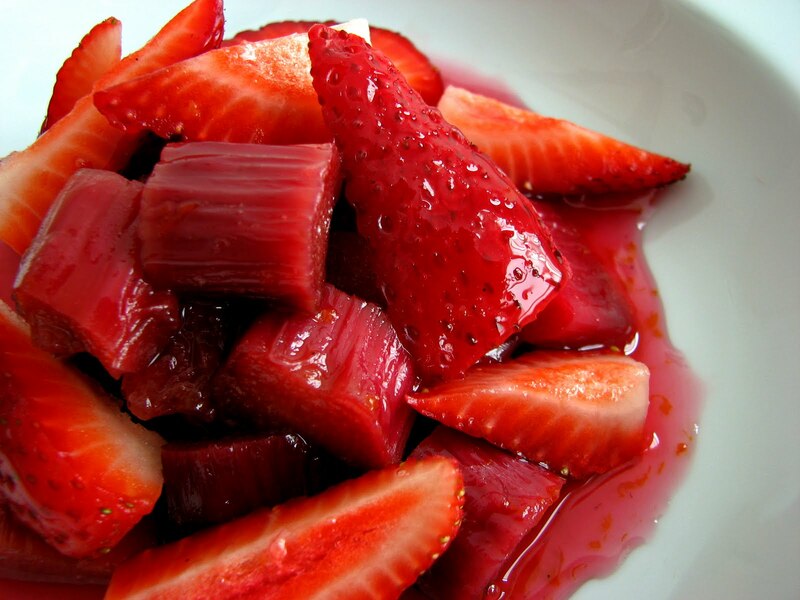 Hull and cut strawberries into thin slices and place in a bowl. Toss with sugar and taste for sweetness. Add balsamic vinegar a teaspoon at a time, to taste. Set aside and let macerate for about an hour. Freeze the ice cream according to your machine’s instructions. Pour into a clean airtight container. Put a piece of plastic wrap on the surface, cover and place in your freezer for an hour or two to firm up a bit. Drain strawberries in a strainer and reserve the syrup. 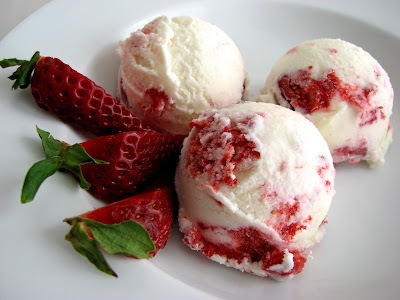 When the ice cream is ready, pour about half of it into another container and dollop with strawberry mixture. Repeat and press the strawberries into the surface. Scoop into ice cream dishes and enjoy with a drizzle of strawberry balsamic syrup.